You have probably heard some atheists suggest that belief in Santa is sort of like a gateway drug for belief in gods. Santa belief may be much easier for a young child to swallow. Perhaps teaching a child to believe absurd things (e.g., Santa) without evidence could help to prepare him or her to believe even more absurd things (e.g., Jesus). The hypothesis that Santa belief facilitates religious indoctrination seems plausible. At the same time, many atheists will tell you that learning the truth about Santa led them to question some of the religious beliefs they had been taught. Finding out the truth about Santa may have sparked some skepticism, critical thinking, and a desire to learn the truth about other things. With so many similar reports, it seems reasonable to speculate that one's experience with Santa belief could facilitate skepticism. Of course, it does not have to be one or the other. Maybe belief in Santa facilitates religious indoctrination and paves the way for the early stages of questioning one's religious indoctrination. Wouldn't that be something? I cannot know with absolute certainty whether belief in Santa made the Jesus stuff any more palatable to me than it would have been otherwise. Since I was indoctrinated to believe in both Jesus and Santa from birth, I am unable to remember a time when I hadn't been exposed to both. Still, I am sure there was a time when I understood what I was taught about Santa far better than what I was taught about Jesus. 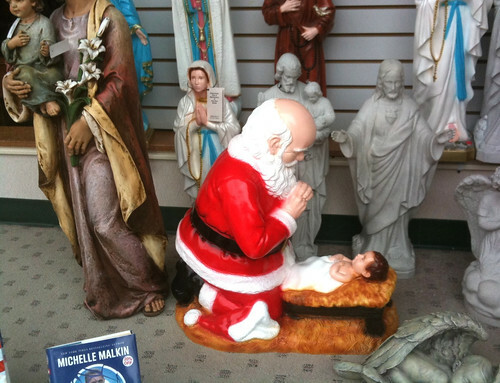 Maybe this was the moment in time when the Santa stuff could have facilitated the Jesus stuff. I do recall being able to wrap my head around the Santa myth even as I struggled to comprehend all of what I was supposed to believe about the Jesus myth. For that reason, I suspect that Santa was an effective gateway to religious indoctrination for me. At the same time, I have no doubt whatsoever that Santa belief sparked some initial skepticism and critical thinking. Learning the truth about Santa made me question the Jesus stuff even though I was able to continue believing it for many more years. When the Santa myth fell, I remember wondering why my parents had lied to me. I'd later realize that they had lied to me about Santa purely for their own entertainment. But at the time, I was much more curious about figuring out what else they might be lying about. After all, it hadn't just been Santa. They had lied about the Easter Bunny, Tooth Fairy, magic, and who knows what else. And all because they thought it was cute or funny! Clearly, I could no longer trust them. I remember asking my parents at one point whether Jesus was made up like Santa and these other characters. They were horrified. The fact that their reaction was so different to this question than it had been around Santa, the Easter Bunny, and Tooth Fairy told me something. Maybe these things weren't equivalent. They insisted that Jesus was real. I was initially suspicious because the Santa lies had taught me that I could not trust them like I thought I could. I think I was able to go on believing because everyone else I knew supported the Jesus myth. Had this not been the case, I suspect I might have lost my religious belief several years before I did. If belief in Santa could both facilitate religious indoctrination and fuel skepticism, what is an atheist parent to do? Should such a parent lie to his or her children about Santa in the hope of stimulating skepticism or refrain from doing so for fear of planting seeds of religious belief? I imagine this is far too simplistic and there are many other considerations a parent must make when considering whether to lie to his or her children about Santa. As a childfree atheist, this is not a decision I'll ever have to make. And for that, I am glad.